Friday was National Carnival Day, so I took the opportunity to use a few of the vintage picks I had purchased last year. 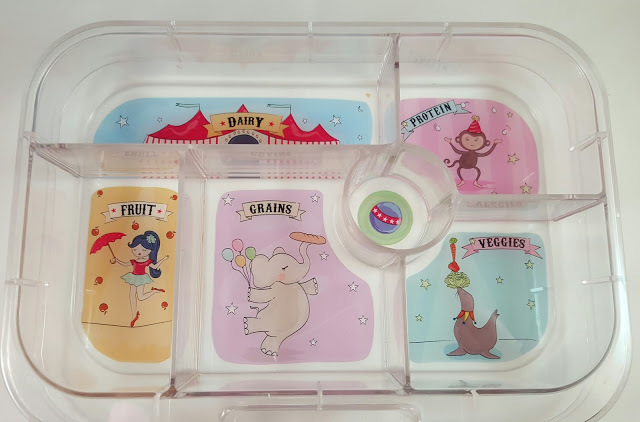 I also selected the Yumboxes with the trays shown below because the pictures went really well with the carnival theme. 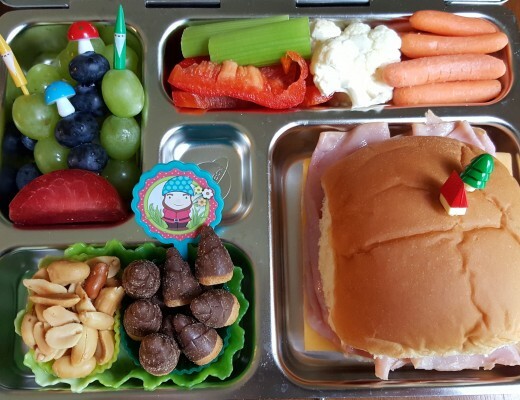 My son’s lunch is below. 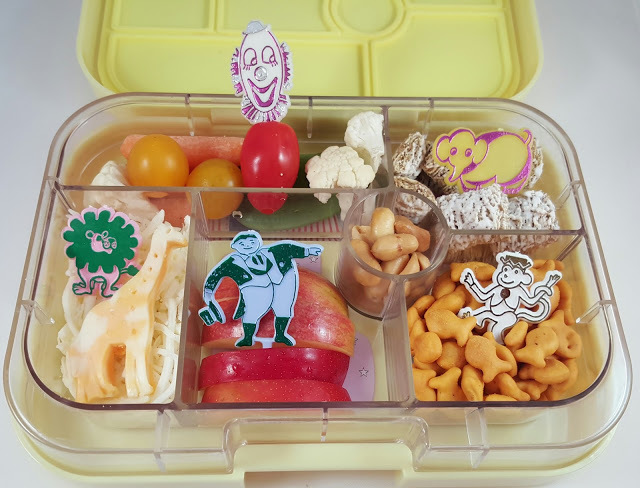 He had veggies, fruit, frosted mini wheats, baby Goldfish, and peanuts in the little circle section. I added clown and animal picks for the carnival theme. My daughter’s is similar with a few different picks and cheese in place of cucumbers. Lately, she has been liking shredded mozzarella. So, I placed some of that below a slice of Colby cheese cut in the shape of a giraffe. I used the giraffe cutter from this set to cut the cheese and press the image. I think these monkey picks are really cute. I got all these vintage carnival/circus themed picks from the Mother Goose Collectibles store on eBay. 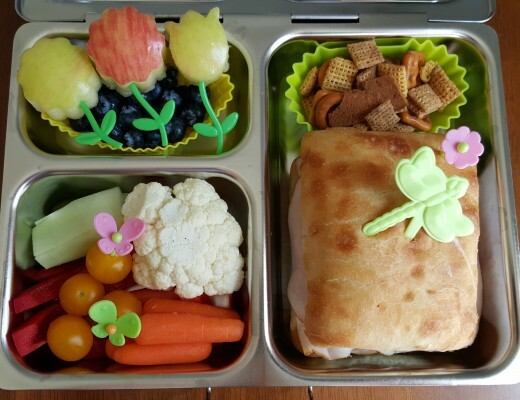 A side note about these lunches. I packed them on Wednesday night and my kids ate them on Friday. 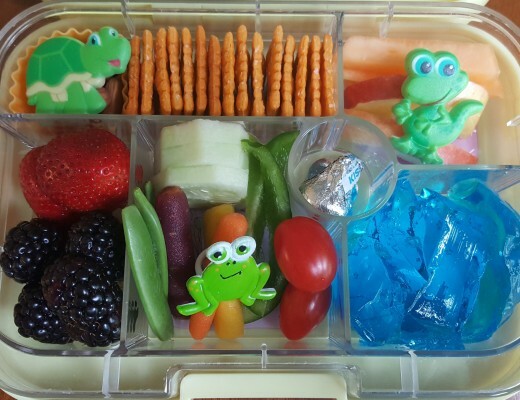 The leak proof seal on the Yumboxes is perfect for packing lunches ahead. It keeps each section completely separate from the others. This means all the foods stay just like you want them. In this case, the cheese did not dry out, the apples did not brown, the crackers and mini wheats stayed crunchy, and the veggies stayed crisp. 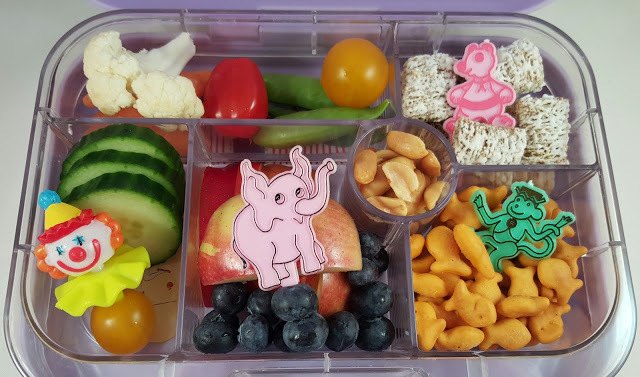 Also, the Yumboxes stack well in the refrigerator so it is really easy to pack ahead for times when I will be away for work or home late.